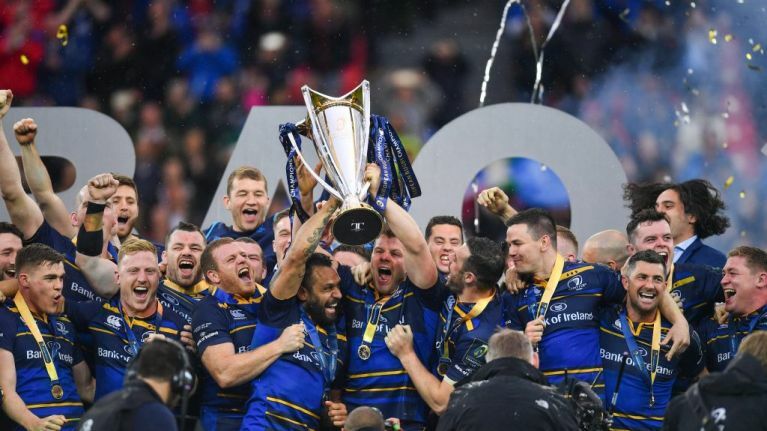 Leinster have been crowned champions of Europe for the fourth time after a thrilling victory over Racing 92. It looked as though the French side might have been about to edge the boys in blue when Teddi Iribaren scored his fourth penalty of the day with just ten minutes to go. Leinster had been deadlocked with Racing for the whole game, and looked as though they may have been left to rue two missed kicks by Johnny Sexton. Three penalties from Sexton had helped Leo Cullen's men keep pace with Racing throughout the game's first 70 minutes, but as it hurtled towards its final stages it was New Zealander Isa Nacewa who made all the difference. When all hope looked lost, Nacewa kicked a penalty to equalise on 73 minutes, and two minutes from time Leinster took the lead for the first time in the entire final. There was still one heart-in-mouth moment left for the Leinster faithful to endure as Remi Tales chanced his arm at a dropgoal in the final minute, but the kick soared wide and Leinster were left with the taste of victory. Ireland fans will be celebrating in Bilbao tonight... and we hope the same can soon be said of any Irish in Lisbon. Dion Fanning on the change that’s coming... HIT PLAY.